It will be held from Wednesday, September 13th 2017 to Saturday, September 16th 2017 at Hotel The Celecton Cikarang, Jababeka, Indonesia. Since the first establishment in 2012, it has received high enthusiasm and eager anticipation from local and international audiences. 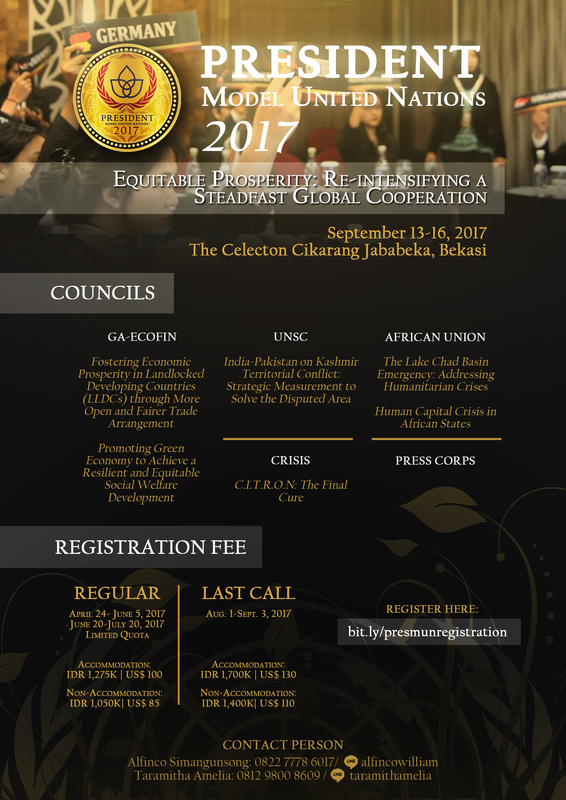 In line with our grand theme “Equitable Prosperity: Re-Intensifying a Steadfast Global Cooperation”, PresMUN 2017 will keep its attractiveness through providing opportunity for delegates who act as UN Representative to acquire practical skills in constructive and lively forum while also enjoying the most memorable social activities and seminar accompanied by speaker who deeply involved in International world.